Our sci-fi books, movies and games are filled with exploration of the galaxy and the universe at large. It’s all planet this and star system that, and how many parsecs between them. Digital Universe does an excellent job in letting you navigate the universe in 3D – but it's still very hard to do things that would be simple on a 2D map. Even if you have a 3D atlas of stars which allows you to travel freely through virtual space, like Digital Universe or Redshift, that experience is no less confusing. Humans are not good at navigating through true three-dimensional space.4 Even simple things like trying to find clusters of stars are extremely difficult. Compare this to a traditional (2D) map. It’s very easy for us humans to see that two cities are close to each other, for example. 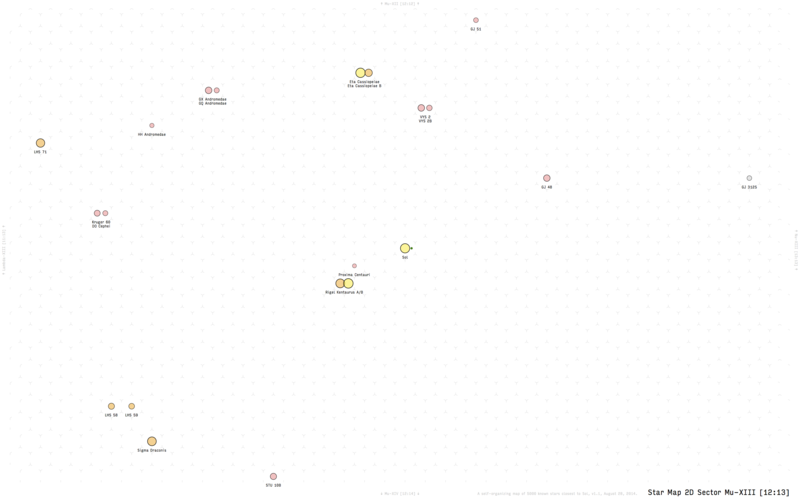 At a glance, we can see clusters, gaps, strings, and so on. We can plan and reason about the map. There are 2D star maps already, of course – Winchell D. Chung’s maps being probably the best examples. So why make another? So again, similarly to 3D virtual atlases, with 2D views it’s not easy to do basic things at a glance. 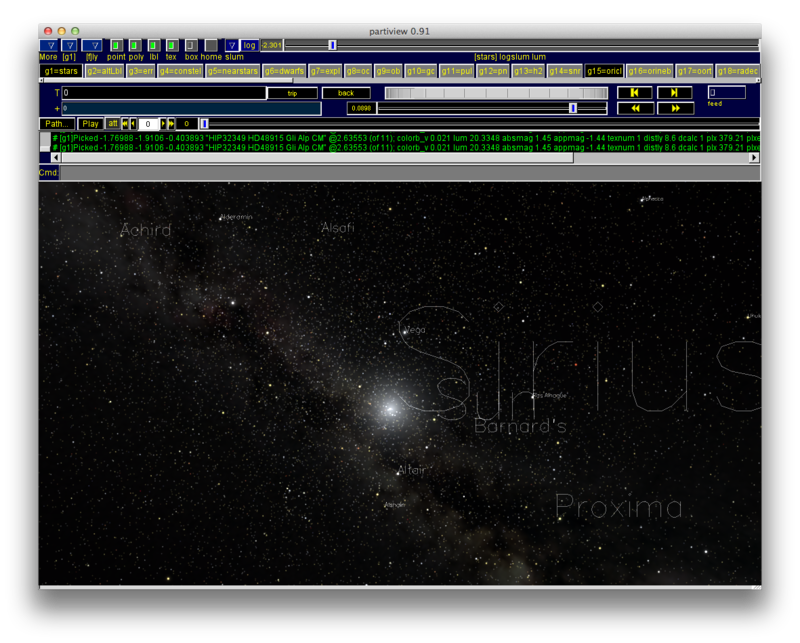 Instances of outright lies (for example, Sirius and Mirzam rendered next to each other) are minimized. See if star is solitary (no close neighbours). See what stars are neighbouring any given star. Note also what isn’t our goal here: perfect representation of 3D space on a 2D map. We are trying to minimize the distortion but we can’t ever hope to get rid of it completely. … UNLESS YOU HAVE THINKING MACHINES THAT CAN DO THE WORK FOR YOU. Which we have. Thanks to the amazing thing that is general purpose computing, and thanks to a particularly clever algorithm by the Finnish academician Teuvo Kohonen, we can leave the work to the machines. 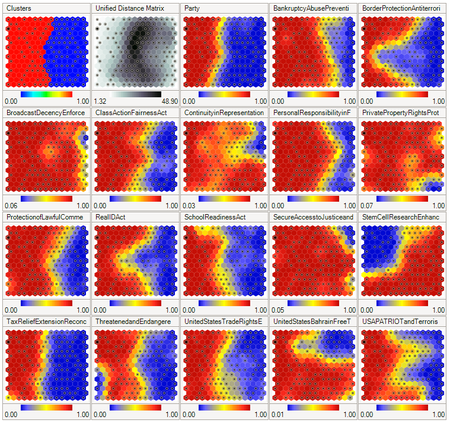 A classic application of a self-organizing map is in combination with heatmaps. A self-organizing map is an artificial neural network that learns to represent multi-dimensional data on a (usually 2D) map. It can be used to analyze huge data tables – for example, a university’s students can be plotted on a self-organizing map according to their grades in different courses. Such a map can then help in finding students with similar strengths and weaknesses. I simply applied a well-documented algorithm to an obvious-in-retrospect dataset. Of course, it wasn’t that simple to actually arrive at something usable. It took me 5 months to find the winning formula7 – there are many parameters that have to be chosen by experimentation, and every training of such a large Kohonen network takes anything from half a day to more than a month of continuous CPU usage. The map consists of 848x600 hexagonal tiles. The aspect ratio is √2:1,8 same as the international paper size A standard (A4, A3, A2, etc.). The map is toroidal (‘wrap around’). In other words, opposite edges of the map are connected. This means that, for example, ‘going through’ the top edge ‘teleports’ you to the bottom. If you remember the game Asteroids, you probably know what I mean. The reason for this is because it is easier for the 2D self-organizing map to be weaved through the 3D space if it’s toroidal, which means less distortion. There are exactly 5000 stars on the map. They are Sol (the Sun) and the 4999 known stars closest to it from David Nash’s HYG Database. It’s a sphere of stars 72 light years in diameter, with Sol at its center. Stars are color-coded by spectral type. 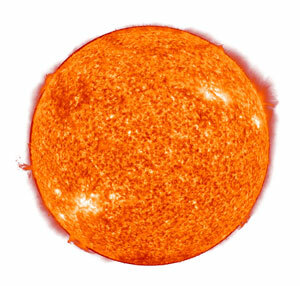 The size of a star on the map corresponds to its absolute magnitude – larger is brighter. Sol (our home star) and the 3 closest stars. You can see that while Sol has the little green planet beside it, the other star systems don't. This means it doesn't look like those star systems have a habitable, Earth-like planet. 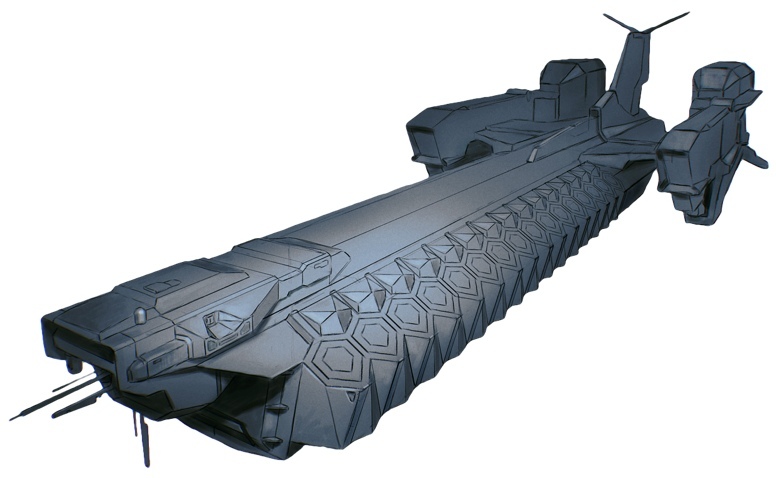 The whole Mu-XIII sector. (Click for bigger.) Note the little links at the edges of the map – they tell you which sector is neighboring on that side. The 'poster' (only a small part shown here) is a rendering of the neighbourhood of Sol without the hexagonal tiles getting in the way. It contains about a hundred stars including Sirius, Van Maanen's Star, Barnard's Star, Procyon, Luyten's star and others. Buy the printed poster for $39 or buy a more colorful version for the same amount. Both bundles below include an overview map (PDF), a meta-map of sectors NOT AVAILABLE YET, all the 576 sectors (PDFs), index files, and the CSV file with all the raw data. Stars are mostly labeled by their standard catalogue codes (for example: HIP 89937). 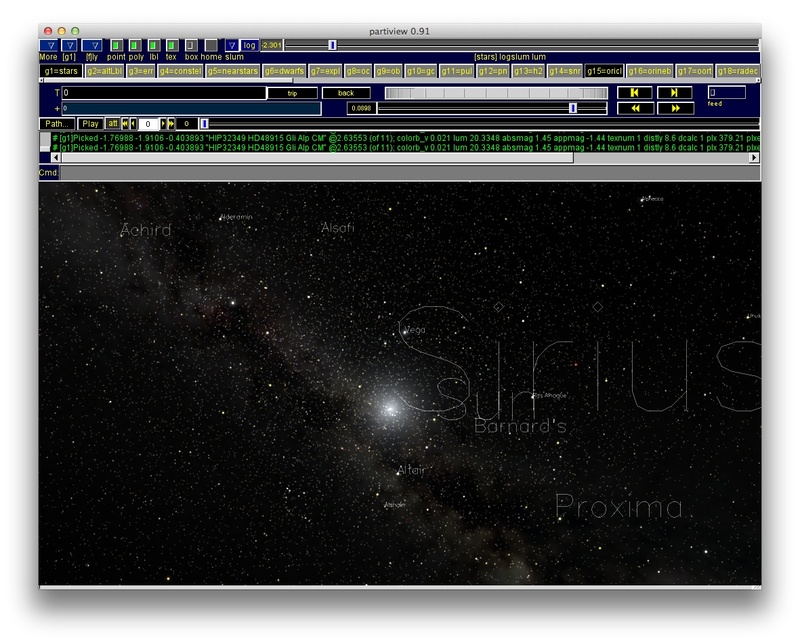 This makes it very easy to research each star on astrological databases such as Simbad. This also makes the map pretty boring. Stars are either labeled by a proper name (for example: Aldebaran) or by a constellation-based name (for example: Chi Draconis). If none of those two is available, a cool-sounding catalogue code11 is chosen over a more commonly used one (for example: STU 10B is chosen over HIP 86162). One row per star, with a ‘literary’ name, a ‘scientific’ code, 2D coordinates, 3D coordinates, habitability, and other datapoints for each. The PDF files do not contain the font (Input Sans Condensed) that you see in the screenshots above. You can download the font here (free for personal use). This was, by the way, my original motivation for creating the 2D Star Map in the first place. I am using this for my gamebook / free exploration game called The Bodega Incident. You can learn more about that project at egamebook.com. If you’re a (hobby) astronomer, you might like the idea of seeing stars in their context without having to fire up 3D software every time. Pick a star and find out which sector it is in. Or, just pick a sector randomly. Print out the sector and it’s neighbours. Based on the epicness of your project, you can print out just 1, or four, or 16 papers, or whatever. Arrange them on the floor or on the table. The little notes on the sides are a hint for you about what comes where. Keep in mind that each page has a 1-hex border at each side that belongs to the neighbouring sector. Start planning your galactic conquest (or whatever else it is you’re doing). Stars that are well known but are outside the scope of the map:12 Achernar (44), Acrux (98), Adhara (132), Alcyone (112), Algenib (102), Algieba (38), Alnath (40), Alnilam (411), Alnitak (250), Alphard (54), Antares (185), Arneb (393), Bellatrix (74), Betelgeuse (131), Canopus (95), Deneb (990), Dubhe (37), Enif (206), Etamin (45), Hadar (161), Izar (64), Kaus Australis (44), Kochab (38), Markab (42), Menkar (67), Mirach (61), Mirphak (181), Nihal (48), Nunki (68), Polaris (132), Rasalgethi (117), Rigel (236), Saiph (221), Scheat (61), Shaula (215), Shedir (70), Spica (80), Tarazed (141). Star Map 2D by Filip Hracek is licensed under a Creative Commons Attribution 4.0 International License. The underlying data is public domain, of course. I am releasing the computed 2D coordinates to public domain, too. Everything else (the hex maps, the indexes, this text) are CC-BY 4.0. I am Filip H. and you can reach me at filip dot hracek at gmail dot com or on Google+.